It was my fiances grandparent’s 60th anniversary party last weekend, and we all brought appetizers. Mitch and I go to this local restaurant a lot called Rocco’s and they have the BEST meatballs! One of our favorite thing about them is the generous dollop of ricotta cheese that they put on the side. 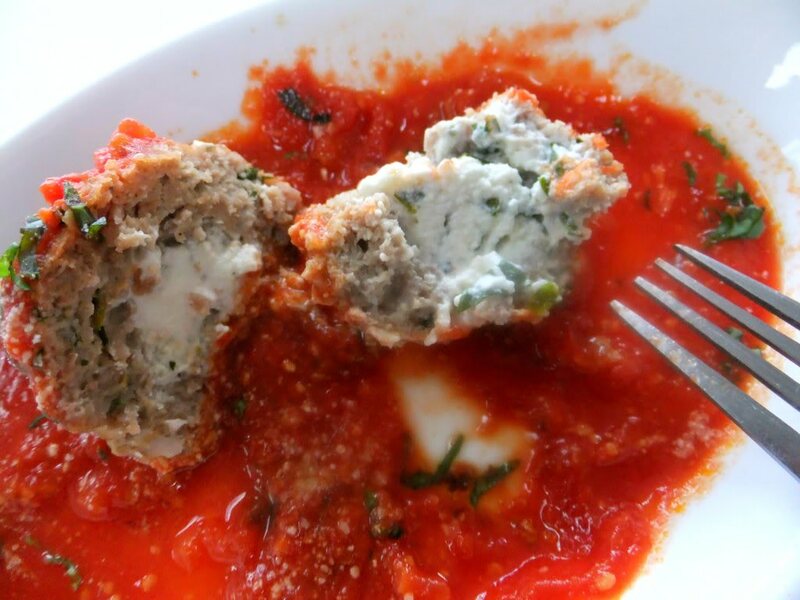 Mitch came up with the idea to put the ricotta cheese in the actual meatball. So after some Google searching I came up with this recipe. It was AMAZING, and a big hit at the party! Sauce: I made homemade sauce-will post that recipe on a later date! 1. Start by adding the basil to the ricotta cheese. Then take the ricotta cheese and form little balls and place on a greased baking pan. Make about 20 and place in the freezer to chill for about an hour or so. 2. In the meantime combine the meat, breadcrumbs, egg, milk, salt, oregano, garlic, parsley and pepper into a bowl and mix together with your hands. 3. 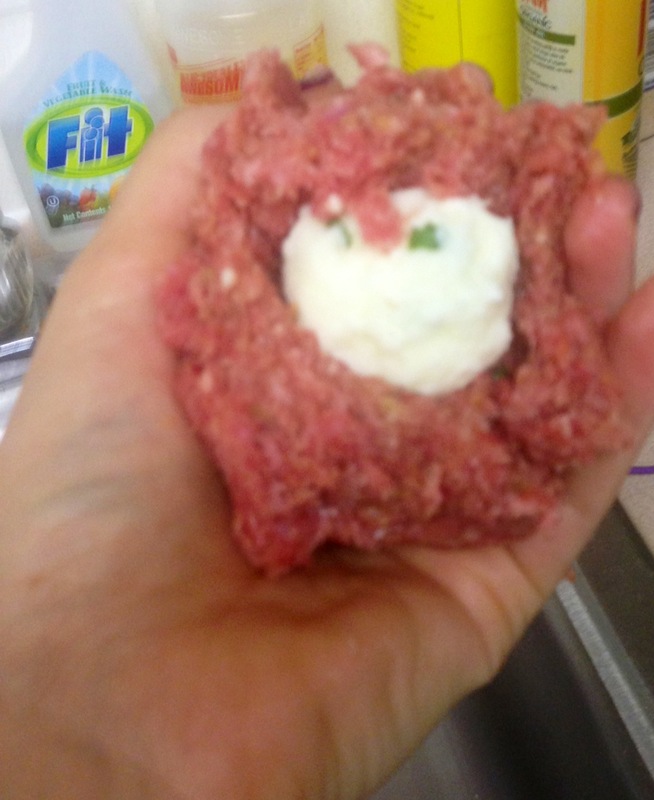 Once the ricotta cheese has formed into a ball and is frozen, simply take the meat mixture and form the meatball around the cheese. Make sure the meatballs are all a consistent size. 4. 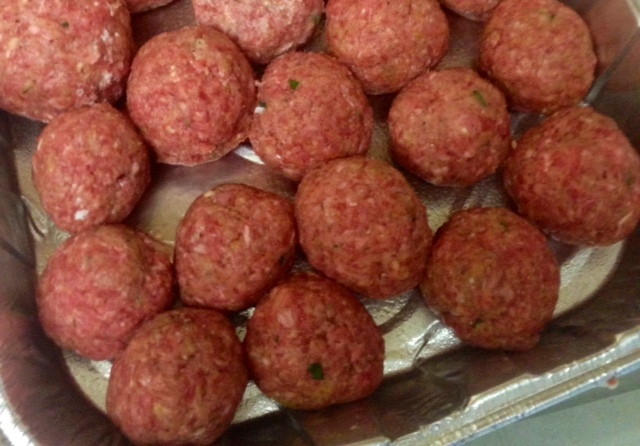 Place the meatballs into the oven at 425 degrees and bake for 25 minutes. 5. Serve with sauce, parmesan cheese and red hot chili pepper flakes!! Yum yum yummmmmmm. I wanna make these soon!